It is the first time a Bahamian was elected to such a post at the IDB level, almost 40 years after The Bahamas became a member country. 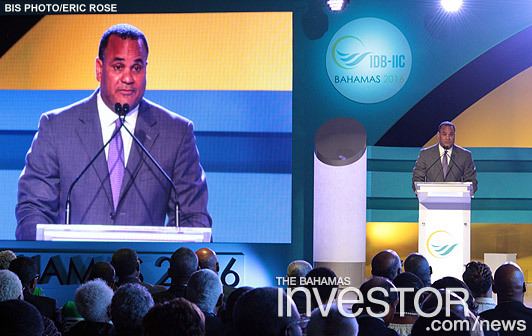 “It is my honour as Governor for The Bahamas to accept the chair of this year’s annual meeting of the Board of Governors of the Inter-American Development Bank and the Inter-American Investment Corporation,” Halkitis said as he addressed the Inaugural Session as Incoming Chairman April 9, 2016. The Bahamas hosted the 57th Annual Meeting of the Board of Governors of the Inter-American Development Bank and the 31st Annual Meeting of the Board of Governors of the Inter-American Investment Corporation, April 7-10, 2016 at the Baha Mar Convention Centre, the first time in the Caribbean since held in Jamaica in 1979. Halkitis said that the high-level meetings provided The Bahamas with the opportunity to showcase not only the country, but also the region, in what there is to offer and the challenges and struggles faced. He specifically identified those challenges as climate change and its potentially devastating impact on Small Island Developing States; the urgent need for reform in the energy sector to reduce cost, improve competitiveness and support economic growth; and the need to address labour productivity. “The de-risking threat, if not addressed aggressively has the potential to result in the disconnection of regional economies from international financial settlements, trade financing and remittances. We are grateful for the role the bank is taking in facilitating dialogue among the stakeholders with a view to arriving at a better understanding, and mitigation of these potential impacts,” Halkitis said. “The Bahamas is fortunate to have a development partner in the IDB that is not only a source of development financing, but also a source of technical assistance and research that will enable countries particularly in the region to adapt for growth,” he said. Net flows into the Caribbean Region from 2011-2015 totalled $588 million. He also said he had no doubt that the entity ‘NewCo’ created at the 2015 meeting in Busan, Korea will engender economies of scale for the bank, and ultimately produce a more focused and tailored approach to doing business with the private sector in the Latin America and the Caribbean region. The Inter-American Development Bank recently wrapped up its annual meeting encouraging Latin American and Caribbean countries to strengthen their fiscal positions and prioritize infrastructure investments in order to emerge stronger from the economic slowdown. Atlantis, Paradise Island has announced a partnership with Caesars Entertainment Corporation (Nasdaq: CZR). The two hospitality and gaming companies have created an alliance designed to offer Atlantis' world-class resort experience to members of the gaming industry's premier loyalty programme, Caesars Entertainment's Total Rewards.